Information, data and research are the fuel for investment decisions. Over the years, as new information has emerged and evolved, investors have found innovative means to harness new insights to help inform their decisions. Today, some forward-looking investors are turning to environmental, social and governance (ESG) analysis to provide additional perspectives to complement existing research efforts. Julie Moret, head of ESG, explains how ESG could contribute to a holistic risk-management approach as well as an evolved investment evaluation framework. Across the asset-management world, interest in environmental, social and governance (ESG) has soared since the launch of the Principles for Responsible Investments (PRI) in 2006. At last count, nearly 1,400 signatories, representing US$59 trillion in assets under management, had signed up to the principles, committing to integrate ESG considerations into investment decision-making, ownership practices and reporting. ESG analysis can trace its roots back to the 1960s, when certain faith-based organizations adopted ethical screens to identify and exclude companies from their portfolios that did not meet their moral values. Typical so-called “sin” stocks included tobacco and alcohol. As the emergence of heightened social and political awareness grew in the 1970s, the practice of screening extended to encompass conduct, behavior and violations of internationally accepted norms and standards. Today, a more nuanced approach has evolved that can incorporate a broad range of techniques from positive screening and/or the use of ESG to mitigate risk or contribute potential alpha1. At Franklin Templeton, we make a clear distinction that ESG is different from ethical investing or values-based investing. And, we do not think it should require a trade-off in terms of performance. Instead, we believe ESG is about risk-based investing which evaluates, in equal measure, all potential risks and drivers of long-term return, and assesses whether those risks are priced in. It is compatible with the principles of prudent investing. We believe the same analytical rigor that applies to a risk-management and investment-evaluation framework should be developed for an ESG framework. By employing an ESG lens, we believe investors should look to understand the ESG-related business risks and opportunities companies face. This could include assessing the potential impact of ESG factors on a company’s long-term business model and the resilience of companies to adapt to ESG changes. Over time, these considerations may reshape competitive advantages and ultimately the sustainability of business growth and long-term value creation for shareholders. In the wake of the 2015 United Nations Climate Change Conference in Paris (known as COP21), there is likely to be increased scrutiny on finding ways to reduce carbon emissions. Over the long term, this may have implications for businesses using and producing fossil fuels that could find themselves structurally challenged by new rules or targets. Investors employing an ESG lens to examine metrics such as a company or country’s carbon emissions, intensity, reserves or energy mix may find themselves better able to identify those that are more flexible and able to adapt. ESG analysis is not just about identifying and measuring risk; we believe there are also investment opportunities. Across the world, some significant demographic trends are apparent—such as growing populations—which put a strain on natural resources including water. In our view, companies that can capitalize on the growing demand for efficient water solutions as well as those that demonstrate sustained growth while reducing use appear well-positioned to adapt their business models to changing ESG issues that can be material for their long-term success. Investment managers need to be able to measure and understand risk in order to manage it. At Franklin Templeton, we want to ensure risks we take in our portfolios are understood, are known, are an intended part of the investment process, and that we have the potential to be compensated. We believe that analysing the more traditional quantitative-risk measures—such as tracking error or beta—alongside more qualitative ESG risk metrics that capture quality of management and reputational risk provide for a more rounded and multi-dimensional perspective. As the quality and availability of ESG data and tools continues to deepen and evolve, we believe there can be some benefit to those asset managers who invest the time to understand the data and how it can be used to further inform their investment evaluation. ESG data can provide that new perspective to uncover potential hidden risks that lie beneath the surface of balance sheets and financial ratios alone. As risk management becomes a bigger priority for firms and investors, we believe that analysing ESG risk factors alongside the more traditional statistical and quantitative risk factors deepens our understanding of the potential downside risks. Correspondingly, time invested today on evolving investment research practice to incorporate an ESG framework as part of the investment process will, we believe, distinguish those firms that are successful. 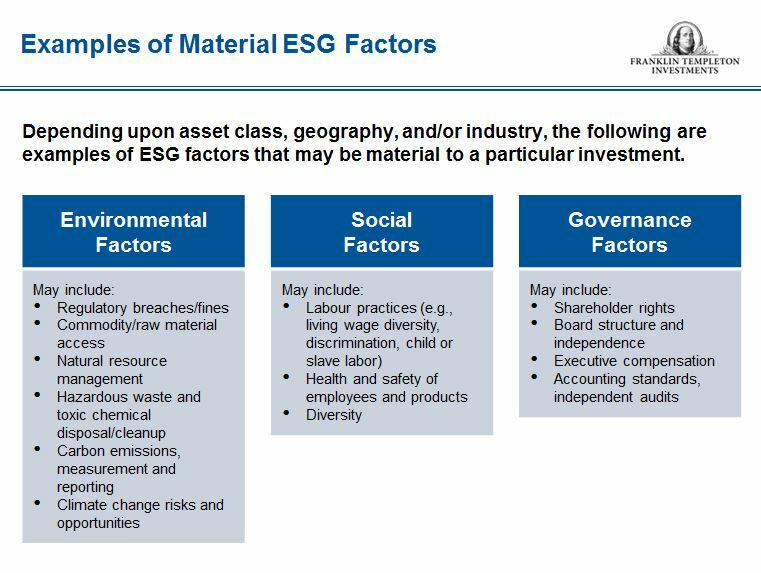 Below is a categorization of commonly recognized ESG approaches. In practice, one or more of these approaches will be combined. Negative screening: the exclusion of investments based on one factor or a combination of factors such as ethical, values, or religious considerations; or for violation of compliance with international standards and norms. Positive screening: The corollary of negative screening is consciously investing in those companies that score well on ESG criteria. Engagement: Involves engagement with investee companies on ESG matters such as executive remuneration, shareholder rights, diversity and climate-risk disclosures. Integration: The explicit incorporation of ESG risks and opportunities evaluation alongside traditional financial analysis. Thematic: Investments made on sustainability themes such as water, low carbon or climate- change adaptation. Impact: Investments made with the intention to generate a well-defined set of social or environmental goals alongside financial goals; for example, social bond-fund investing in areas such as education or affordable housing. 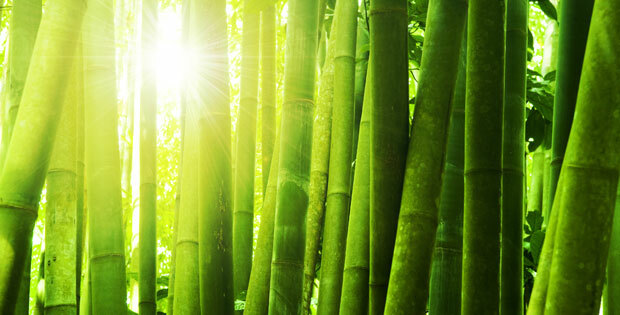 ESG and faith-based investing, such as Shariah-compliant investing, can be categorized under the spectrum of sustainable and responsible investment practice, although they remain distinct concepts. An ESG lens can provide a broad-based analysis on which Shariah-specific requirements are added. The combination of the two lenses can provide a higher degree of scrutiny to weed out potentially weaker-performing companies and seek to focus on those companies that demonstrate strong business practices and long-term value creation. All investments involve risks, including potential loss of principal. Stock prices fluctuate, sometimes rapidly and dramatically, due to factors affecting individual companies, particular industries or sectors, or general market conditions. 1. Alpha is a risk adjusted measure of the value that a portfolio manager adds to or subtracts from a fund’s return.